After having some kind of identity crisis and a couple decades of decline, the Historical Barolo house of Fontanafredda seems to be experiencing a new renaissance, and is slowly gaining back it`s position as one of the great Barolo makers. With the house style leaning more on the classical side. Shy aromas: ripe dark berries, leather, nutmeg. Medium bodied, almost a bit thin. Big, and somewhat harsh tannins. Delicious, smoky and spicy fruit on the mid palate, but turns abruptly very dusty and earthy, and in the finish/aftertaste, almost bitter. This wine needs a looooooong decanting. After 5 hours it developed more body and the bitterness and austerity gave space for the fruit to shine. 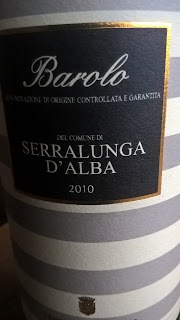 Good, structured Barolo, but needs many years to reach it`s full potential.